Pleasure craft made in Italy, basically represented by luxury yachts, are still discussed positively, in spite of the international economic difficulties of recent years, and not only due to the constant growth of the sector but also to a significant trend towards international export. In particular the latest international market surveys show an overall growth on the superyacht market of 6%, with a worldwide order book of 688 units for the 2005-2006 sailing season. Italian yards, well known for design, styling and interior finishes, are unquestioned market leaders, both for number of units and the overall length of pleasure craft under construction. As regards the placement markets it is important to point out that we are dealing with a "global" market inasmuch as the potential customers for these luxury toys, people defined in private banking terms as "high net worth individuals", are found in various parts of the world. The Italian yachting industry exports more than 60% of its entire national production, confirming that this is an international economic segment. 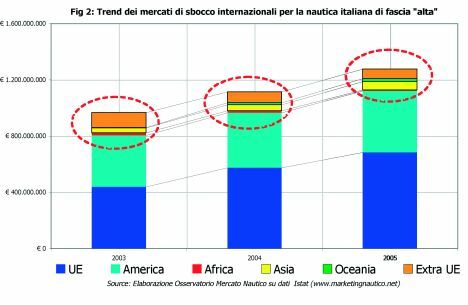 Figure 1 shows evolution of the market positioning breakdown of yachts made in Italy. The same figure shows, in spite of national market recovery, that foreign markets are the main destination of Italian luxury yachts. As for exports, Figure 2 shows the export trend of the Italian yacht-building industry to various countries of the world. In general, as well as evidencing a growth in business volume from exports, it also shows a growth in business from emerging areas such as Asia, East Europe, Oceania and Africa. In greater detail, between 2003 and 2005, there was a growth in exports to Asia and Oceania, while in the same period East Europe as a whole underwent a slight drop though there are certain countries, such as Russia, with a dynamic yachting market in continual growth. So analysing the various international market outlets for luxury yachts we find certain emerging markets that show interesting development prospects. With reference to the latter, quantification of the potential market is particularly important. It is unquestionably delineated by the presence of the so called and by now well known super-rich, who make up the main customer profile for luxury yachts. 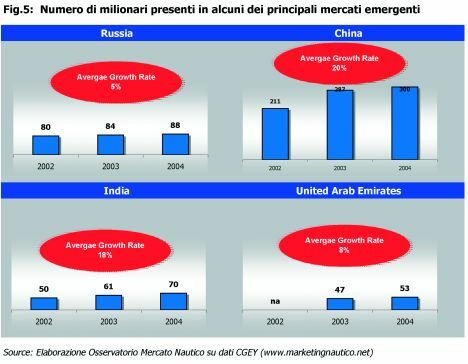 Figure 3 shows the evolutionary trend in the number of millionaires in the main emerging areas such as Asia-Pacific, the Middle East and Latin America. In 2004 the total number of millionaires in the emerging countries amounted to 2.9 million individuals, a 12% growth compared with the previous year. But apart from the trend it is especially interesting, as shown in Figure 4, to point out the percentage of total worldwide millionaires in the emerging countries. A propos of this it should be underlined that over and above the growing number of individual millionaires a further element is the percentage of them in the emerging countries, which has grown from 33% in 2002 to 34% in 2004. In this context it should be remembered that only certain countries can be defined as "emerging markets for luxury yachts": Russia, China, India and the United Arab Emirates. Figure 5 shows the growing number of individual millionaires in the above countries, with the related average growth rate over the past 3 years. 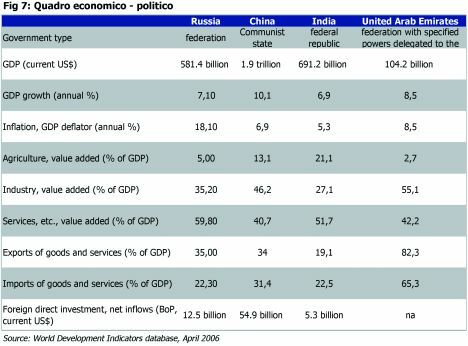 In overall terms Russia, China and the United Arab Emirates are among the countries which as well as having the largest number of millionaires also evince an extremely interesting evolutionary dynamic. 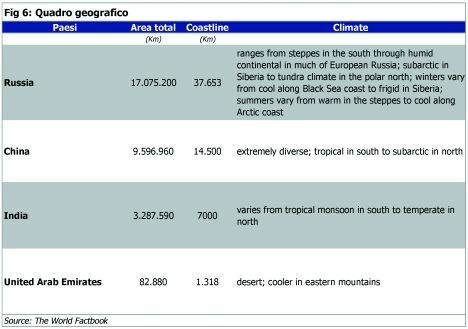 Going further into detail we can identify useful indicators towards outlining a country-profile for a structural analysis - found in figures 6 and 7 - that provides a summarised geographical, social and economic-political picture of Russia, China, India and the United Arab Emirates. But to remain in a strictly yachting context, as well as the macroeconomic picture it would be helpful to have some specific references regarding the yacht market in these countries, with view to outlining certain considerations regarding market evolutionary trends. China is certainly an interesting market for yachts, but it is believed that this market will effectively take off only when there are objective conditions for development, consisting fundamentally of port infrastructures. We cannot yet speak of a specific Asiatic yachting system because there are no adequate structures for pleasure craft sailing. But the presence of numerous business projects for new port structures bodes well for the near future. A recent project is the one in Qingdao, north-east China, where a marina of enormous potential is being built. It was devised for the 2008 Olympics sailboat races, but as soon as these are over it will be converted into a tourist structure. In particular, after the Olympics the structures will be extended and converted into a vast area for pleasure craft, with a total investment of 9.1 billion dollars. In a recent interview Paolo Vitelli, current president of UCINA, the National Association of Boat Industries and Shipyards, underlined how little the Chinese love the sea and sunbathing, but they are very fond of clubs. In fact all the new marina projects envisage luxury clubhouses: the yacht will be less of a means for sport than a success symbol for rich Chinese. In conclusion, the Chinese market shows all the potential signs for development of a yachting market, especially in the upper range, but this will only be possible when a series of objective conditions are concretely developed (port structures, regulations etc.) as well as proper consumer education, the latter being necessary for effective development of the potential market. As for the United Arab Emirates, in the course of the last sailing season Italian exports to these countries amounted to 14.3 million euros, a 27% growth with regard to the previous year, confirming the dynamic nature of this market for yachts made in Italy. This year's Dubai Boat Show had more than 400 exhibitors, 75 of them Italian, with 120 yachts in the water and 25 thousand visitors on the quays of Mina Seyahi. Some surveys speak of the overall sum of deals concluded as being in excess of one hundred million dollars, evincing a growth in step with the building sites that have sprung up all along the coast, working at a sustained pace to make this place a Caribbean for Europeans. The whole yachting infrastructure currently offers about 28.350 berths, but new marinas are under construction which envisage a further 25.000 berths, thus doubling availability. Forecasts say that "elite" pleasure craft sailing will explode in the next five years. In analysing the United Arab Emirates market it is also interesting to note the direction taken by certain banks in the area such as Hsbc Middle East and the Abu Dhabi National Bank which have developed specific financial products for yacht purchase. From analysis of emerging yacht markets we see that Russia over the last sailing season became one of the countries where growth in importation of Italian yachts was greatest.. In detail, exportation of Italian yachts to Russia amounted to 11.8 million euros, a growth of 143% over the previous year. These figures confirm the growing attractiveness of this market. In fact the sale of yachts is flourishing, hand in hand with other top of the range products. Yachts are very fashionable and the wealthiest Russians are replacing "economical" models with luxury yachts costing 10 million dollars plus. The fashion seems to be dictated by millionaire Roman Abramovich who owns 3 of the world's most luxurious vessels. Many owners imitate the Russian tycoon by keeping their precious yachts in Mediterranean ports, but some take them to Russia and limit themselves to mini-cruises along the canals that link the internal waterways around the Russian capital and other big rivers in the European part of the country. The 12th Moscow International Boat Show (MIBS 2006) enjoyed a 21% increase over the previous year. More than 250 exhibitors, 10% of them first time participants. 80% were foreign companies from 15 countries including the UK, Poland, Finland and Turkey. Lastly, in analysing the performances and attractiveness of emerging markets on the basis of available information, what clearly stands out is that the global nature of the yachting market may find numerous business opportunities in these new outlets, where some forecasters see a growing trend towards luxury yachts. So from a marketing point of view, aiming at effective market penetration, the specific features for each country must be evaluated with view to planning and implementing the best strategic-operational approach.